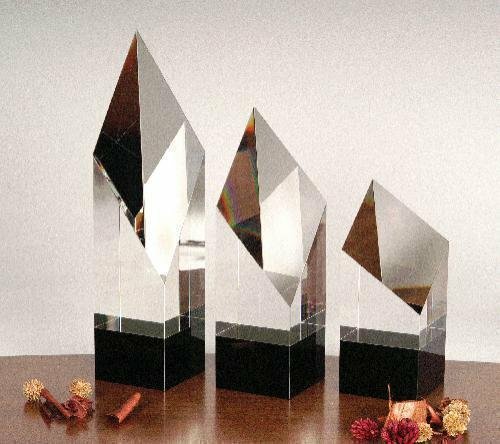 Recognize great efforts with an award that is equally outstanding. The Endeavor Theme-Award is a unique mix of media whose vertical aluminum rods reach for the stars. Crafted of jade crystal and wood that is lacquered with black and silver metal-flake, this design is a celebration of recent endeavors as well as an optimistic nod towards the future. For aesthetics we recommend etching your award inscription and positioning your logo as shown. A romance card elaborating on this theme is included for your presentation. Presenting an elegant design for an elegant performance. Our mouth-blown Esprit sports sweeping curves for a light and airy feel that is simply irresistible. The brilliance of this piece makes it the perfect addition for the home or office. This 9" X 12" Designer acrylic corporate plaque boasts an elegant 3 dimensional look and feel with gold and silver access, complemented by aluminum hardware. 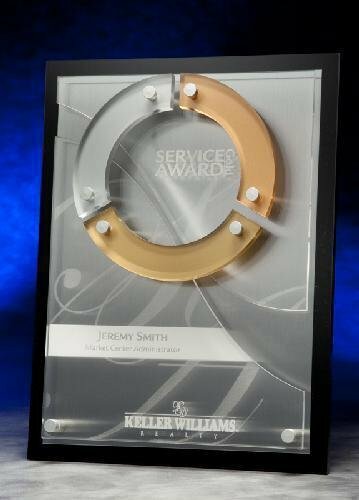 This acrylic corporate plaque award is an excellent choice for any award presentation. 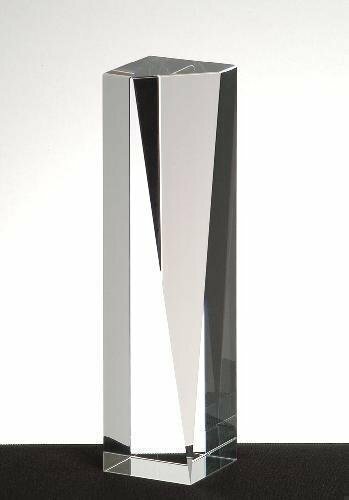 Optical Crystal Excellence Award. This item comes packed in an elegant gift box. Available in three sizes. Optic crystal is the perfect medium to showcase the beauty of this contemporary classic. A series of angles and planes, the Excelsior is designed to give presence to your congratulatory message.